When cooked right – not too much, not too little, and just a touch of pink salt, and maybe a drop of extra virgin olive oil, peas are delicious. But in this pesto, they’re even better. Plus, they are CHEAP, and I honestly prefer frozen over fresh (which are even less expensive). Frozen peas taste better to me than fresh – which, albeit strangely, makes sense. Frozen foods are typically picked at peak ripeness then flash frozen to lock in freshness, where as “fresh” foods are typically picked underripe and travel across the country – or even globe- before they end up at your grocery store. I usually get the Whole Foods 365 brand of organic petite frozen peas (although conventional frozen peas are still a good choice. They are not a heavily sprayed crop). They’re just $2.49 on Amazon Fresh, which is great for ordering fresh groceries without having to leave your house! So, I typically choose and reccomend frozen petite pois. They’re the tastiest, in my opinion, too! Peas are a good source of complete plant-based protein, offering 8.6 grams of protein (17% DV) per cup. In fact pea protein powder is one of the most popular vegan protein powders because of it’s high protein and bioavailable iron. Peas are high in fiber, offering 8.8 grams of fiber (35% DV) per cup. That makes this pea pesto an excellent choice, especially if you’re trying to lose weight. It provides satiating protein and fiber that will keep you feeling full. Peas are a good source of the B-vitamins, particularly thiamin and folate, delivering 25% and 28% DV per cup, respectively. Thiamin helps the body metabolize food for energy and maintain proper heart and nerve function. Folate plays a role in DNA synthesis and repair, and can even influence your mood. Research indicates that many people with depression have lower levels of folate in the blood. Use the pesto as a dip for vegetables or gluten-free crackers, or use it as a healthy, protein-and fiber-packed savory sauce to mix into pasta or grilled or sauteed vegetables. You could even use it mixed into veggie bowls. I love putting it on sauteed kale and my fave gluten-free pasta. If you love pesto, you may also want to try my Cashew Basil Pesto as another alternative. 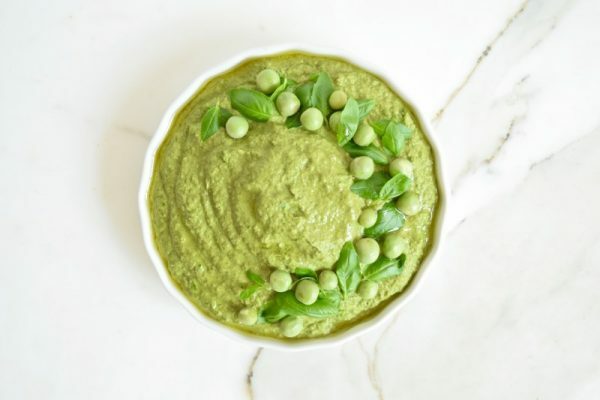 A vegan pea pesto perfect for dipping or on top of pasta or veggies. Use the pesto as a dip for veggie sticks, put it on gluten-free pasta, or smother sauteed or roasted veggies in it. *You can use fresh peas, but I find frozen peas taste better. If using fresh, be sure to cook/blanch first.